Knapsacks shouldered and bibles in hand, a group of Christian pilgrims from Indonesia, China and the United States trooped into the remains of a fourth-century church in ancient Philadelphia last month. Gazing up at the columns that tower over what is today the Turkish market town of Alasehir, the pilgrims listened as their Australian guide read from the Apostle John’s letter to the early Christians of this city, one of the biblical Seven Churches of Revelation. 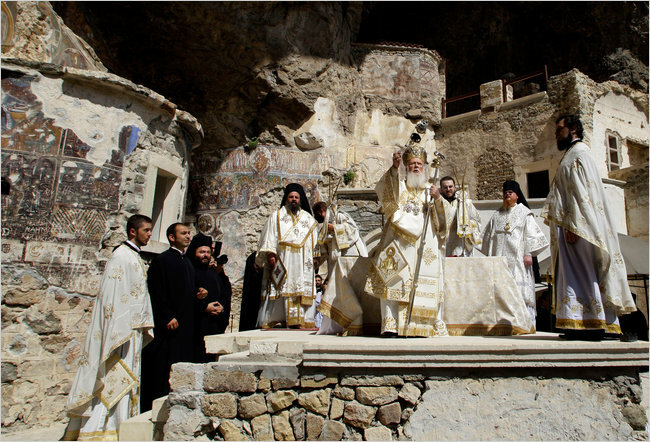 Patriarch Bartholomew I, center, the spiritual leader of the world’s Orthodox Christians, conducted a service at the Sumela Monastery in Trabzon, northeastern Turkey, in 2010. “It makes you see the Bible in 3-D and color,” the guide, Dan Fennell, said of his tour of historical Christian sites around western Turkey. “In Laodicea, for example, where we are headed next, you can now see things you could not see five years ago,” Mr. Fennell said of the ruins of the seventh city addressed by the Apostle John. A Muslim nation long ill at ease with its pre-Ottoman history, Turkey has discovered Anatolia’s Christian heritage as a way of drawing visitors and of cultivating an image as a meeting-point and arbiter of civilizations. “We have recognized this as a special field of tourism and as a special cultural wealth,” the Turkish culture minister, Ertugrul Gunay, said in an interview in Ankara. By next year, his ministry aims to increase the number of religious tourists to Turkey to more than three million, from 1.3 million last year. “I expect an onslaught of visitors in the coming years,” Mr. Simsek said. Or as Fox puts it: South Korean Man Found ‘Crucified’ on Cross. A South Korean man said to have fanatical religious views was found dead on a crucifix after an apparent attempt to emulate the death of Jesus Christ, the Korea Herald reports. The body of the 58-year-old taxi driver was found on a wooden cross Sunday in an abandoned quarry mine in Mungyeong, with his hands and feet nailed to it. Police tell AFP that the man was only wearing underpants and a crown of thorns when they found him on the cross. He had a stab wound to the right waist and several whip marks. “We found at the scene pieces of paper describing how to construct a cross and carry out a crucifixion,” a police office told AFP. An autopsy showed that he used an electric drill to make holes in his palms, police told the Korea Herald. A hammer, a hand drill and a knife were found nearby the body. Police are investigating whether the man killed himself or had help in his crucifixion. This story posted at Reuters Africa is about a scientist who thinks the concept of evil is obsolete and needs to be rebranded. It’s all a matter of empathy deficit disorder.